Personal bankruptcy is a method that may be used to overcome unmanageable debt and make a fresh start. An individual filing for personal bankruptcy in Orlando has two options: Chapter 7 bankruptcy or Chapter 13 bankruptcy. A Chapter 7 filing liquidates assets to pay off creditors, while a Chapter 13 filing allows the debtor to retain more assets and pay off his or her debts over a period of time. At Clark & Washington, our knowledge extends beyond these court-supervised procedures to include debt repayment and collection options that negate the need for a bankruptcy filing. Although we specialize in Orlando bankruptcy, we recognize that not every financial problem has the same solution. If we feel that filing for bankruptcy in Orlando is not the best option for you, we will suggest alternative action you can take to get your finances back in order. Our experienced Orlando bankruptcy attorneys will always help you choose the right course of action for your unique situation. We value your time, and we will never put you on hold or make you wait to receive the help you need. 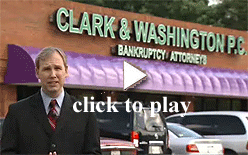 When you call Clark & Washington, your call wall be promptly answered, and one of our friendly, knowledgeable Orlando bankruptcy experts will assist you with any questions you may have. Call (407) 898-0299 to speak to a Clark & Washington Orlando bankruptcy specialist and make an appointment for a FREE consultation.